The John W. Campbell Memorial Award for hard science fiction novels started this year—it’s an odd thing to choose to honour Campbell when you think about it, as he was a magazine editor all his life. I suppose he did publish novels as serials. Oh well. 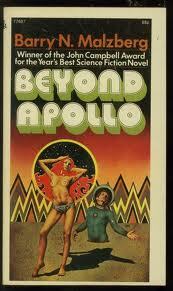 The judges this year gave it to Barry Malzberg’s Beyond Apollo, which I haven’t read. Second place was James E. Gunn’s The Listeners, a book about SETI, and third was Christopher Priest’s A Darkening Island, aka Fugue for a Darkening Island, a very uncosy catastrophe novel. They also gave a special award for excellent writing to Silverberg for Dying Inside. Probably I am naive, but I had assumed that just about every science fiction fan had read Barry Malzberg’s Beyond Apollo, and I was rather surprised that Jo Walton had not. It’s a shame really because in my opinion, Beyond Apollo is not only one of the finest works of science fiction, but of fiction period, that I have ever read. If I had to choose between it and Silverberg’s Dying Inside, it would be close, but I’d choose Beyond Apollo because it is more important to science fiction than Silverberg’s book. Beyond Apollo is look at the dark side of science fiction. It explores the darker alternatives and delves into the psychology of a grand scheme to colonize the solar system (or Venus, as the case may be). Where is the glory in all of this? it asks in its brilliant way. What is the point? Campbell was a science fiction optimist and that might make Beyond Apollo seem an odd choice for the first John W. Campbell award, but the novel is in many respects a dialog with Campbell’s views, a reaction to them, a different perspective. This dialog was necessary in order for the genre to evolve. It’s the great thing about our genre, these decades-long dialogs (the Heinlein-Haldeman-Scalzi dialog is another one that comes to mind). A key point is that not just anyone could have initiated this dialog. I think Barry Malzberg was the only one who could have started it. His knowledge of the genre is second to none. His ability as a writer is virtually unmatched. And he was in the right place at the right time to start this discussion. My reading of Campbell is that he generally respected people who argued with him (even encouraged it–thus the BRASS TACKS), even if they didn’t agree with him. Beyond Apollo was the only possible choice for the first Campbell Award because it argued with Campbell’s point of view in a powerful way–one that I think Campbell would have respected, but most certainly disagreed with. There is a short list of novels that I think every science fiction fan should read as early on as possible. It includes books like Asimov’s Foundation, van Vogt’s Slan, Heinlein’s Double Star, Haldeman’s Forever War, Bradbury’s Martian Chronicles, Herbert’s Dune, Bester’s Demolished Man. Willis’ Doomsday Book. And it includes not one but two books by Barry Malzberg, Beyond Apollo and Herovit’s World. If you haven’t read Beyond Apollo, got get it and read it. Beg, borrow or steal. (The Kindle version is available here.) Within its technical mastery is a deeply disturbing and cathartic paradigm shift in what science fiction is and should be. Science fiction was at a confused crossroads. As its narrator/protagonist Harry Evans said, “The conditions were intolerable.” The novel is the therapy session that science fiction so desperately needed at the time, in order to throw off the shackles of Daddy Campbell and finally move beyond him. Thanks, Scott. It is a great book, and you are probably right about the controversy, which is too bad really. The negative reaction to the technophobia in the novel is surprising. Sure, it takes a negative view of the space program and that would seem to be anti-Campbell. But Campbell published Asimov’s story, “Trends”–his first Astounding fiction–the premise of which was that the public at large woud react negatively to the first attempt to reach the moon. And there have been plenty of technophobic stories that Campbell published as editor of Astounding. Just think of all of the post-apocalyptic pieces that came out of the magazine after 1945 (and some, like “The Last Hope by Don Evans, ASF 9/39, were well before 1945). I really wish people would read it despite any controversy that might surround it because it is a magnificent piece of fiction. I think I should read it because there’s boobies on the cover.